The Kui people are a people with an immense sense of community. They have educated among them who live in more urban areas but primarily dwell in thick jungle and are not easily accessible. Many Kui are located in Kandhamal Disctrict, Orissa. They are early risers tending to their crops and animals. Those who are still steeped in idolatry and Hinduism ritualistically worship many statues. They often fear their gods who require sacrifice or will impute punishment. They live in huts made from a mixture of dung and mud with thatched roofs. Cooking is done over open flame and is primarily made of rice and dhal. Families all live in one room and those who are more wealthy may have one charpi or rope twined bed. There is no indoor plumbing or running water. Their education is brief and many children are illiterate. They have very few material possessions. For many Kui in the Kandhamal district, they have come to salvation through Jesus Christ. In December 2008, they suffered intense persecution losing the lives of many pastors to martyrdom and burning of their homes and churches. The saints are eager to dwell in the teaching of the word, practice vibrant worship and deeply love Jesus. Those who have been redeemed are beautiful, kind, humble and evangelistic believers. 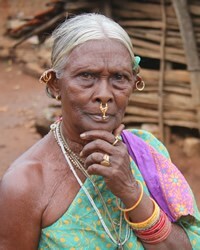 Currently, women in these tribals have not been nearly as educated or trained in the word of God. There is a great need to equip the saints with solid teaching so they might further penetrate their Hindu surrounding culture. Pastors need tools such as vehicles, computers, bicycles and support to reach these deep jungles to bring the Gospel. 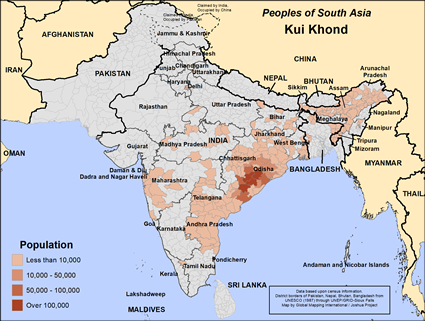 Primarily they need prayer since they are still persecuted with physical attacks from violent Hindu neighbors. The Kui people do not have government or police protection since they are Hindu also. The worship of Jaganath and Kali deeply blinds the unbelievers. The believers choose obedience to Christ at great cost. Please pray for laborers to be thrust into this field. Many believers are sacrificing all they have to continue the advance of the kingdom and need our financial and spiritual support to give them the strength they need.View Kui, Kuvi Khond in all countries.